Update (July 27 2007): As always with these Greasemonkey scripts, any minor change in a site's code can make the script stop working. The ToDo list described below doesn't work anymore, so you could try a similar one. Google Personalized Homepage has a to-do gadget, who'd be be better suited in Google Calendar. As there's no option to add gadgets in Google Calendar, someone created an even simpler version as a Greasemonkey script. While you can't add priorities, sort the events by date or change their order, it's handy to have a list of events next to the calendar. The ToDo list is saved in Google Calendar as fake events, so you'll be able to see it if you use other computers (you'll need to have Firefox + Greasemonkey, though). How to add the ToDo list? First install Greasemonkey for Firefox, restart the browser and then install this script. 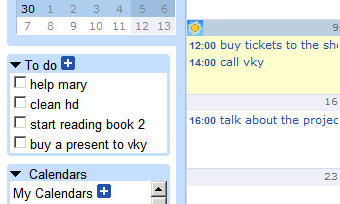 Yeah, Google Calendar definitely needs to add a todo list feature. I use Remember The Milk. It is powerful, simple and integrates beautifully with GCal. Give it a try, you will love it. I used Remember The Milk for some time. It's a powerful tool, but the integration with Google Calendar is still lacking (having to press a small mark to see the tasks kill the whole purpose)..
Maybe if the whole integration was just like this Greasemonkey script, I'd use it much much more. Why won't Google just BUY Remember the Milk? It only seems natural! Remember the Milk is the god of task management. Nothing else comes close. Plus, their interface resembles that slick, clean look that Google is well known for. I'm also a great fan of Rememeber The Milk and I totally agree with dmitri and John. I recommend you post on the RTM user forum asking for better intergration. The one thing that prevents me from moving to 30boxes.com is I can't import Gcal there. Eeeew... 30boxes is the worst. Yuck. 30boxes.com is everything that gCal should have been. a feature-by-feature comparison clearly shows how far ahead 30boxes.com really is over gCal. It's sad and funny at the same time that a small company has a product that is so far ahead of a company the size of Google. Google is the king of half-assed products. gCal, gDocs, Photos, gTalk...all half-assed. I tried Remember the Milk for a while but I have now switched to Todoist. Clean and efficient interface. the scrpit seems to run ok, but when running it skews the rendering of the rest of the page...as in...all the calendar event entries are no longer nicely lined up with the calendar grid and end up offset a half a tick....I otherwise really like the idea though....any thoughts...maybe conflicting with another script? tried resetting everything...issue seems to have resolved itself...maybe combatting with locally cached stuff...anyway...again...nice script! Even after installing the script this doesn't show up on my calendar. Is this for older version of FF? I've been trying to download this for a week now. Is it gone? The script is still there. i'm having trouble getting this to work too. installed greasemonkey and the script and nothing happened. help! You're right, Kate. Try this one. Please please add a TODO list!!! A to-do list would be a killer addition! Scrybe is like google calendar on staroids, I've never seen anything like it. I think google could learn from those guys and add a lists (to-do) module, and if you could synchronize it with BlackBerry's Task list application, like you can with calendar, it would be worth paying for! Little help please...I'm running the greasemonkey script, but no ToDo List....what am I failing to understand? While i installed greasemonkey and the script... i couldn't figure it out.. there is an easier way. Just create an Event that starts at a time that you normally don't have anything going on.. like 7am. Call it To Do List. Make the event happen every day with no end. Just add all the stuff on your list to do..
found the above suggestion by greg to be most easiest though not great for using with htc hero as the calander ends up showing your todo list. This is now three years later and there still is no to-do list? This is an outlook definite advantage as far as I am concerned! Yes, there is. Haven't you heard about Google Tasks?